Your team were very friendly and efficient and answered all my questions promptly. Will definitely recommend you to all my friends. Thank you so much for making our holiday the absolute best! I can sum it up with one word! FABULOUS !!!!!!!!!! Most enjoyable month.If we knew the winter was going to be that bad at home, we would have stayed another month. the problems encountered on arrival were handled well even though it was Christmas. after that we enjoyed our time there. all in all it was a great vacation for us and we look forward to next year. Great area, easy to get around. Lots of stores and resturants . Very quiet. Every time I contacted the office at the Vacation Rentals of the Desert, the employees were very pleasant and helpful. Trish and Vickie are cheerful and left me thinking how competent they are at their job. 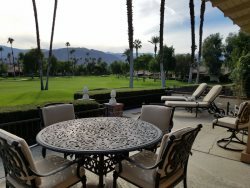 Our stay at 21 BAR was so enjoyable that we plan to come back to Rancho Mirage next year, for a longer period of time. The property is nicely renovated, clean, and in a great location. The beds are very comfortable, and this condo has a well equipped kitchen. Having coffee on the patio, in the morning sun, was so peaceful and a great spot to watch the golfers go by. We found the team very helpful especially when we arrived. We got mixed up and could not find the property. As we miraculously found your office, we were kindly guided to the address by Vicky. We loved the property and hope to be able to stay there again next year. We look forward to our next stay in Rancho Mirage and will definitely use your team again in our search. Thank you for everything. This property is absolutely beautiful! We were there for a short family reunion and from the first conversation with the owner, to the time we packed our things to depart we couldn't have been more pleased. The owner was most gracious, and her property person was outstanding. The home is every bit as beautiful as the pictures and was immaculately clean! We will definately stay here again should we plan another trip to the desert. Great property, only small comment is next time I would prefer to have something with more sun. Team members were great. We were a bit disappointed that we were told we could extend our stay through the end of December. We were advised a week later that we would need to check out Dec. 15th. I don't believe that would have been any fault of the vacation rental, rather the owner. Very nice stay. Purchased property in development while there.